Interpretive signs for an upcoming project near the Harpeth River in Williamson County will highlight the ecological significance of the waters of the southeastern United States. If you didn’t know, the rivers and streams of middle Tennessee are part of the most unique and diverse freshwater ecosystem in the entire world. This has to do with a couple things, namely the temperate climate combined with the fact that much of the area was unglaciated, or it as been more geologically stable than other parts of the U.S.
Just to give you an idea the area is home to more than 250 species of crayfish (70% of all the species in the entire U.S.), more than 300 species of mussels (over 1/3 of these live in Tennessee), and more than half the freshwater fish species in the U.S. Because of this great diversity, Tennessee has more freshwater fish that are at-risk than any other state. These species are at-risk largely due to pressures from development practices, which allow sediments and pollutants to wash into our rivers and streams. 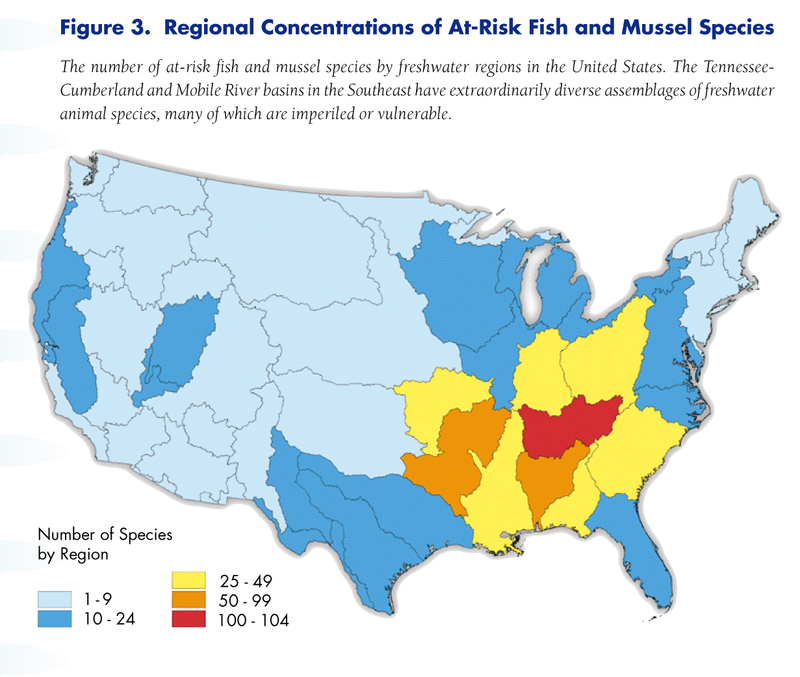 This and other topics concerning protection of critical watersheds can be found in, Rivers of Life or States of the Union: Ranking America’s Biodiversity, just some of the publications found on the NatureServe’s website. As mentioned in an earlier post, the implementation of ‘green street’ practices on Deaderick Street in downtown Nashville will divert approximately 1.2 million gallons of stormwater a year from the Cumberland River. This is water that would have otherwise run unabated into the river carrying all of the pollutants and sediments from the street. Understanding the significance of the region’s biodiversity is a good reminder of what we are trying to protect when implementing green infrastructure planning and strategies –and why this is especially important here in the Southeast and Middle Tennessee. I know as landscape architects it seems like we are always talking about trees, but there are just too many good reasons not to, especially in urban scenarios. On our Deaderick “green street” project we made the focus of one of our environmental education signs on the importance of urban trees. 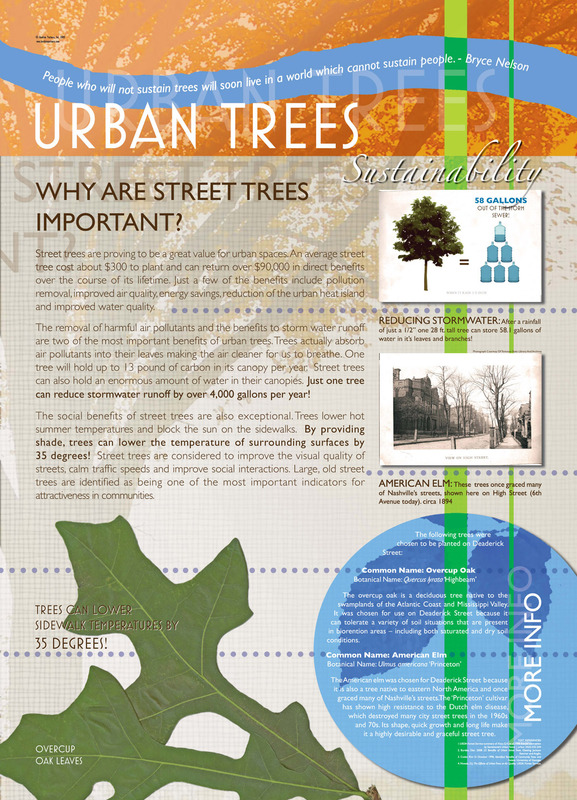 The Center for Urban Forest Research, run by the US Forest Service provided a wealth of facts and resources for us to include on the Deaderick Street sign. Recently, the Forest Service has updated their Tree Carbon Calculator so that it works nationally instead of just for California. You can find the updated version in their Climate Change Resource Center. The calculator runs off an excel platform and allows you to input data for a single tree. Based on your region, tree species, distance for the building, and a number of other factors it will give a basic idea of how much annual energy, emissions and stored carbon you can expect. I used it to see the effects for a couple of trees I have outside my house. Even a small 6” tree has the potential to sequester over 65lbs of carbon dioxide from the atmosphere per year and that big 30” oak tree in my back yard, over 1000lbs per year, not to mention all the energy reductions too. This is another useful tool to help prove the value trees. It is projected that over the next 50 years climate change will actually cause the southeast region to become warmer and drier, which would reduce the amount of forest growth. While the best option for managing this in the future is to keep forest as forest (per a publication from the US Forest Service titled ‘Forest and Carbon Storage‘), it can’t hurt by incorporating as much urban tree growth into new developments as possible, every little bit makes a difference. When it comes to adding more park space, communities are increasingly looking at getting more bang for their buck. Budgets are tight and cities are having to pool their resources from a variety of sources to get projects built. 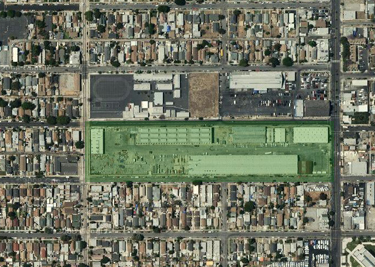 Two recent projects, one that is under construction in Los Angeles and another just announced in New York City, seek to create a park and nature area for their citizens while also constructing wetlands to address stormwater management issues within the immediate neighborhood and the community at-large. The first is the South Los Angeles Wetland Park. The 9-acre park under construction five miles south of downtown Los Angeles on a former transit maintenance facility that is nearly 100% paved. The City recognized that more recreational open space was needed in the area while also needing to improve the quality of the stormwater runoff that ultimately was polluting the city’s beaches. The park transforms the site into a extensive wetland that comprises most of the park. It includes a series of trails, an observation area, and public gathering areas. The park is estimated to cost $24 million. The funding was cobbled together from a variety of sources, including money generated from Proposition O. Proposition O passes in 2004, authorized the city to issue up to $500 million in bonds for cleaning up polluted storm water and bacteria in the City’s rivers, lakes, beaches and ocean. Stormwater Magazine has a thorough article about the genesis of the park and its design. Also, more detailed information can be found on Proposition O’s website. Both of these projects serve as examples of how various communities’ goals can be combined and met by a single green infrastructure investment. As cities approach future planning and implementation efforts, they should look beyond the immediate objectives of the project and assess how the project might serve to address other needs that have been identified in the community. In the list of healthiest and least healthiest states releases from Forbes this month the southern region of the country is once again lagging behind. All in all eight of the bottom 10 were states from the south, including Tennessee which ranked number 44 overall and number 49 in obesity. Why does this relate to green infrastructure you might ask? There are in fact many ways to relate green infrastructure to our health. (Check out the numbers from the earlier post ‘Triple Bottom Line of Green Infrastructure) Some are the obvious reasons such as cleaner streams and rivers, cleaner air, etc, that often create a more desirable environment to become engaged in and interact both physically and socially. But take a step back and consider green infrastructure planning; in brief planning amongst, preserving and restoring our natural infrastructure systems, such as river corridors, woodland networks and open spaces. This type of planning allows us to integrate greenway trails, bikeways and neighborhood trails into our built environment in a responsible way. The more access communities have to resources such as these allows them more opportunities to get the recommended 30 minutes of physical activity per day, increasing the overall heath of the community. There is a strong link between lack of physical activity and chronic diseases such as heart disease and diabetes. Other more indirect regional health benefits stem from increasing the amount of land for natural storm water retention which in turns allows communities to become more resistant to natural disasters. Green infrastructure also can reduce the erosion of precious top soil, which aids local farms. The entire region benefits when a collection of local farms can provide healthy food. Working farms—and forests—also have a significant impact on local economies by providing jobs, aiding tourism and supporting local manufacturing. So in the end, green infrastructure benefits extend beyond immediate storm water benefits and reducing our carbon footprint. By integrating the green infrastructure planning principles we can also provide opportunities to make our communities healthier, reduce overall healthcare costs and hopefully move Tennessee up in the ranks of healthiest states. A couple of us at the office decided to make a roadtrip to St. Louis to see the new Citygarden, a three-acre sculpture park designed by Nelson Byrd Woltz that opened mid-summer. It was a pleasant surprise to see that the street cutting through the two blocks comprising the garden is a green street. The pedestrian bulbs on the south end have openings in the stone curbs to allow water to enter. Small strips of asphalt were also added at each opening along the curb to help divert additional water. The rain gardens are further expanded by incorporating small steel boardwalks along the sidewalk that allow water to move from the pedestrian bulbs to a larger landscape area on the opposite side of the walkway. The boardwalks draw attention to the rain garden as you pass over it. This green street was just one of the many exciting elements found in Citygarden. The park is an impressive addition to the city.